Currently unavailable for purchase on this site. Radical Theatricality argues that our narrow search for extant medieval play scripts depends entirely on a definition of theater far more literary than performative. This literary definition pushes aside some of our best evidence of Spain's medieval performance traditions precisely because this evidence is considered either intangible or "un-dramatic" (that is, monologic). 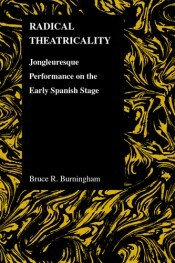 By focusing on the dialogic relationship that inherently exists between performer and spectator in performance -rather than on the kind of literary dialogue between characters traditionally associated with drama- Radical Theatricality diachronically examines the performative poetics of the jongleuresque tradition (broadly defined to encompass such disparate performers as ancient Greek rhapsodes and contemporary Nobel Laureate Dario Fo) and synchronically traces its performative impact on the Spanish theater of the sixteenth and seventeenth centuries. 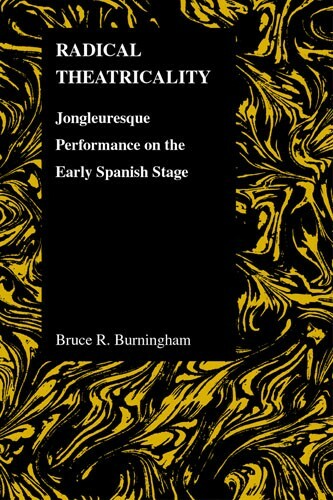 Bruce R. Burningham teaches Spanish and Comparative Literature at Illinois State University, where he specializes in medieval and early modern Spanish literature, Hispanic drama, and performance theory. He is a recipient of an Andrew W. Mellon Postdoctoral Fellowship and a National Endowment for the Humanities Summer Stipend.